I have been looking EVERYWHERE for a cute, inexpensive lampshade to match our little guy’s nursery. I found a few that could possibly work, but saw a $40 price tag (just for the shade!) and finally settled on making my own! 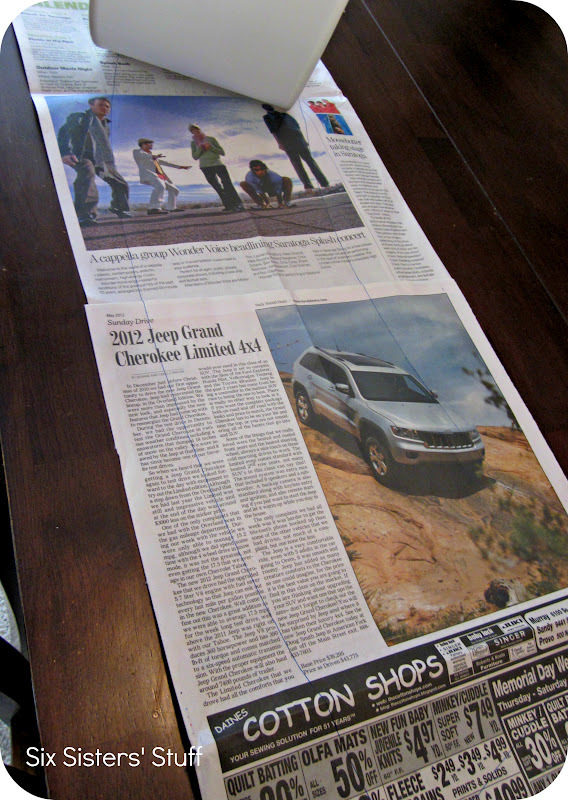 Step 1: Lay newspaper out flat on a table. 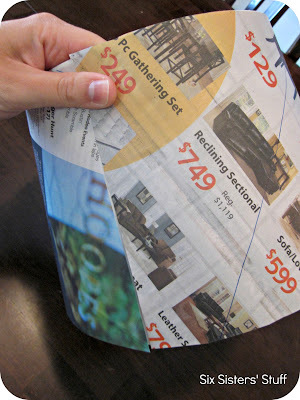 Start with lampshade on one side and start rolling it along the newspaper tracing the top and bottom as you go. Step 2: Cut out the lampshade shape you traced from you newspaper. 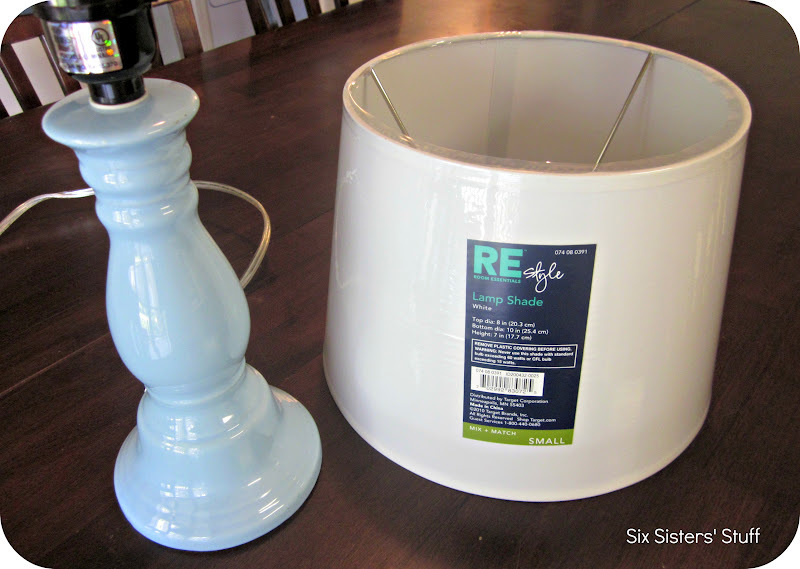 Wrap around the outside of your lampshade to make sure it fits properly. Trim down edges as necessary. Step 3: Lay your newspaper cut out on top of your fabric. Trace around the edge of your newspaper adding a 1/2″ to each side. 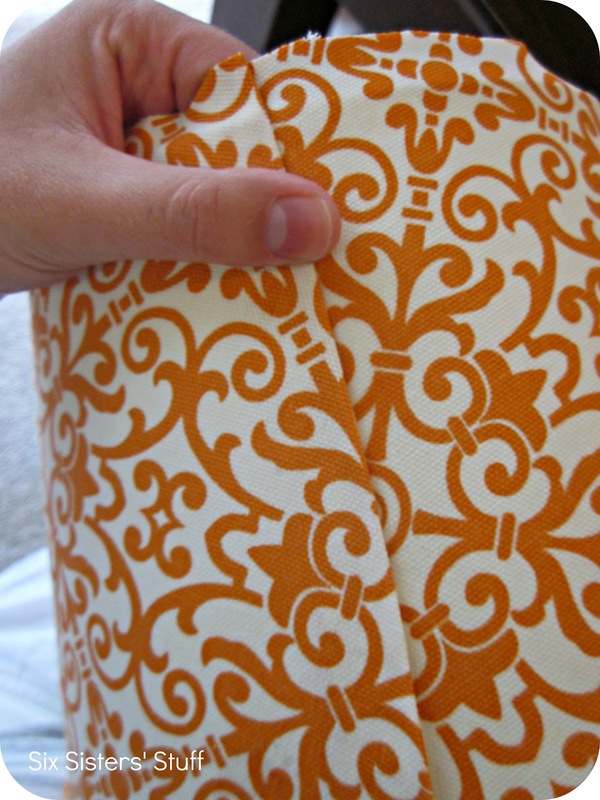 Having an extra 1/2″ on each side will allow you to fold the fabric over the edge of your shade so you can glue it on. 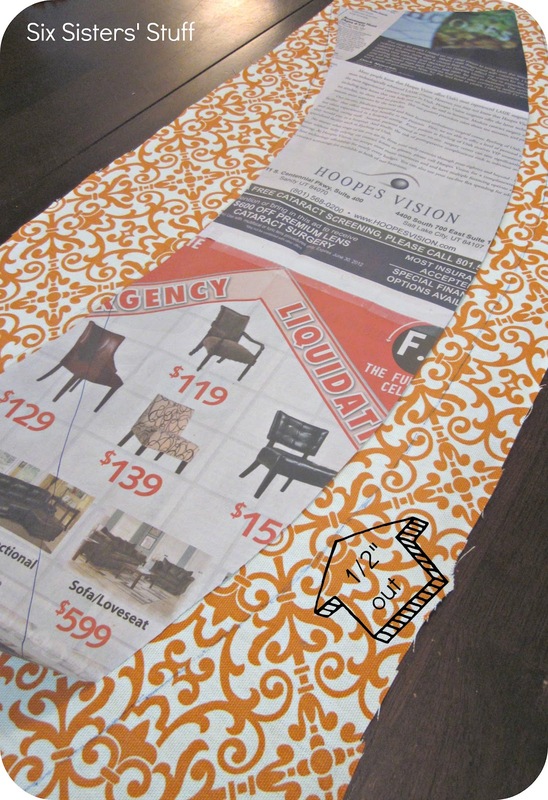 Step 4: After your fabric is cut, lay it face down and spray a thin layer of spray glue/adhesive to the back side. 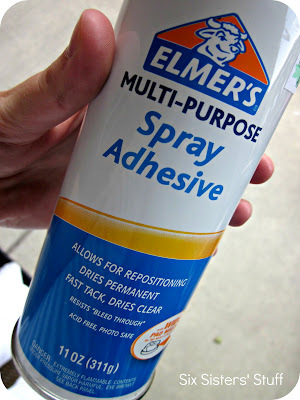 This stuff is very sticky and dries permanently, so make sure to not let it get on things you don’t want to be sticky. I found it works best to lay down a tarp outside and spray my fabric on top of that. Step 5: After you have sprayed the back side of your fabric, quickly put it on the outside of your lampshade. Make sure to smooth out all bumps and wrinkles. If your fabric is patterned, make sure that your pattern is straight. 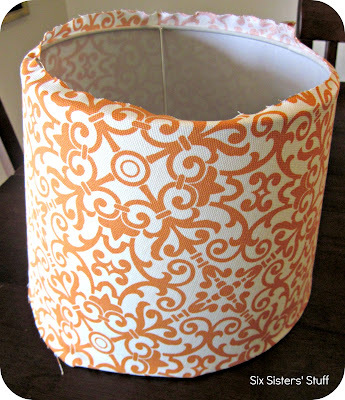 Step 6: Fold over one of the edges of the end of your fabric so it overlaps, creating a seam on your lampshade. 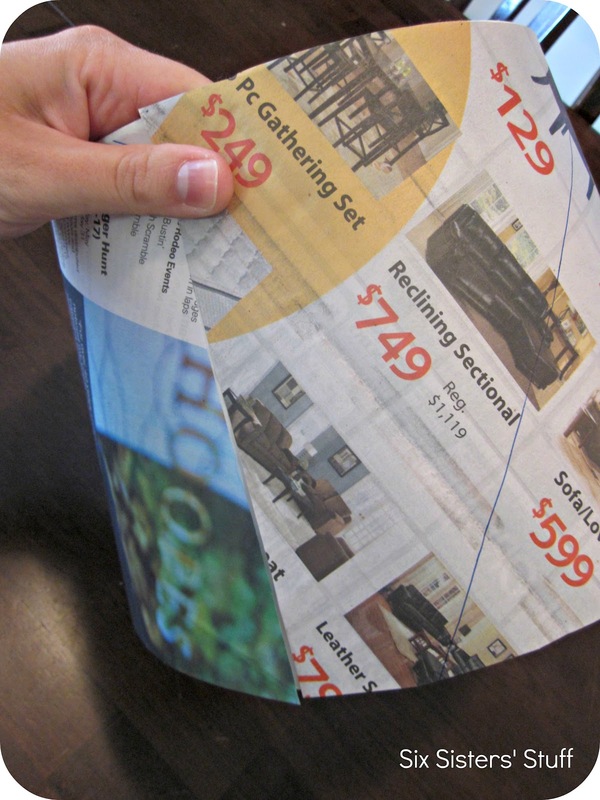 Use a little spray glue or fabric glue to make sure your fold will stay in place. Step 7: Fold the edges of your fabric over the edge of your lampshade and glue down using fabric glue. Step 8: (Optional) Secure any loose edges with hot glue making sure they will stay in place. 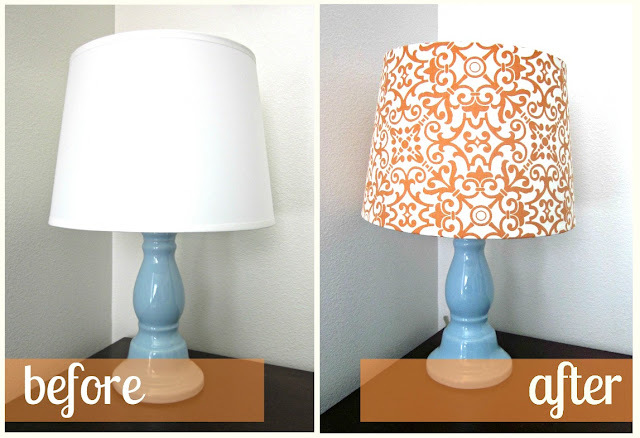 If you feel like your fabric is on your lampshade well enough, you can skip this step. Looking for other easy, inexpensive craft ideas? Check out our Craft Index! Love this! I may have to try this! Okay. Will this work if I have the frame of the shade? The old shade has a silky fabric that I literally put my hand through when I picked up the shade. Thinking this would be fun to try. Also, any tips when the frame is scalloped along the bottom? A good challenge! It might not work as well if you are only using the frame of the shade. I just don't know how well it will hold its shape. Let us know if you try it! love this tutorial, this lamp shade/fabric is super cute!!! That Elmer's spray glue is some STICKY stuff--it works great! This is a easy way to do it! Thanks for sharing! Love this! Just may need to do this! LOVE this post! 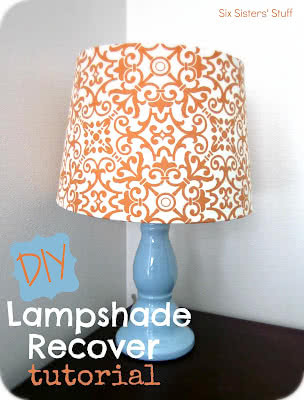 I have 2 lamps at home that have blah white shades that I want to recover and now I know how! Your lamp is gorgeous!!! Love it! Thanks for the great tutorial! I have a lampshade that I just stuck my hand through and desperately needs covering. It was old - I wasn't violent or anything! this is so cute! thanks for the tutorial. there's a party at my place if you feel like stopping by! Thank you for linking up @ Craft, Create & Inspire last weekend ! Do fabrics with strong horizontal or vertical stripes work ok? My shade is a wider drum shape, but still slightly tapered and I am afraid of it turning out curved or wonky. I don't have the fabric yet but found one I really like on line. Thanks! Thank you so much for this tutorial! All of the others I have found online tell you take the fabric off the shade and then put it back on after gluing. This looks much easier and I will be doing this today! Thanks again! I had the same problem, simply putting a 'skin' on the shade seems a lot easier. And I'm not going to complain that this uses glue instead of sewing! LOVE THIS! Will be doing this soon! 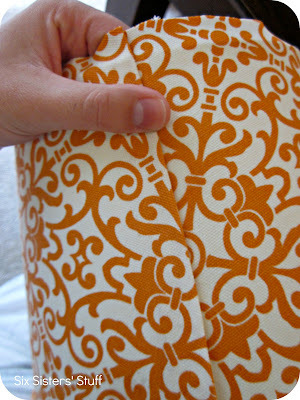 I am trying to find some cute orange fabric. Where did you buy yours at? We find a lot of cute fabrics at Hobby Lobby. Will the same procedure work when covering a lampshade with striped fabric having 2 inch wide horizontal stripes? 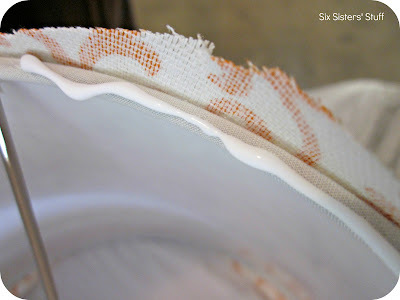 What is the best a textile (fabric)glue in making lampshade? 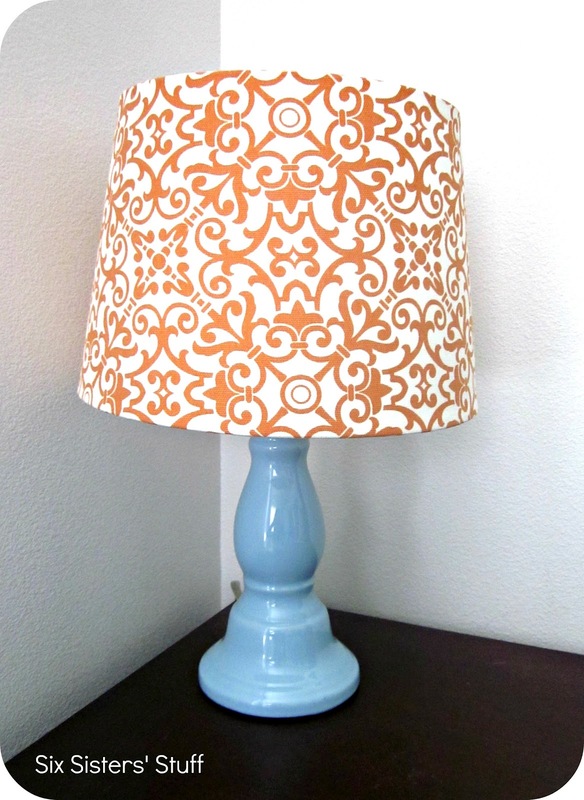 The best fabrics for making your own lampshades are those made from natural fibers such as cotton or linen. 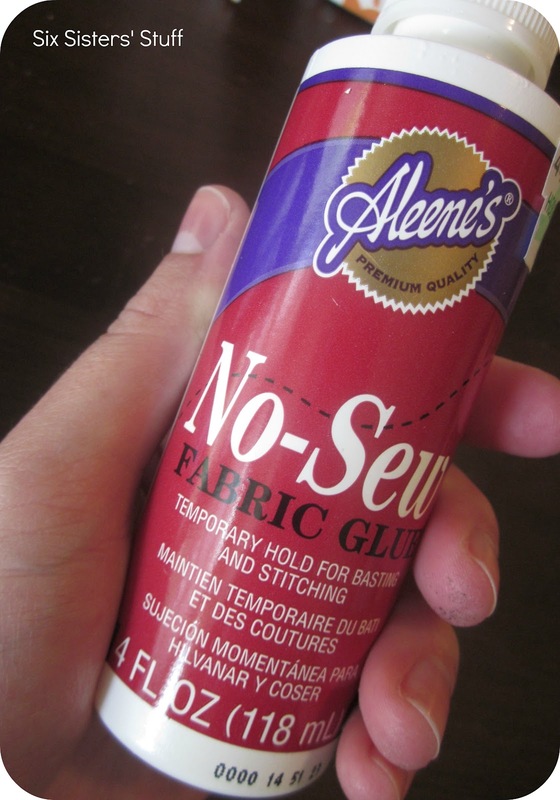 Select a fabric that can be ironed; otherwise, it won't look smooth when you adhere it to the styrene. Sorry I read your comment wrong. A good fabric glue for lampshades is Quick Glue or Fabric Fusion.